An influential Hindu religious figure has been found not guilty of the murder of a temple manager in the southern Indian state of Tamil Nadu. 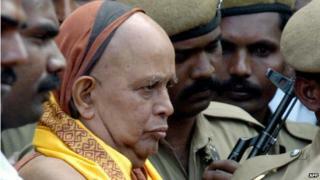 Sri Jayendra Saraswathi, head of a 1,000-year-old Brahmin monastic order, was arrested in 2004 in connection with the murder of Sankararaman, manager of a temple in Kanchipuram. A court also acquitted 22 others charged in connection with the murder. The verdicts came more than nine years after Sankararaman was murdered. The case generated nationwide attention and took several twists and turns. One of the accused was murdered earlier this year. The court ruled that the family of Sankararaman had "failed to identify the accused". It found "no incriminating evidence" against Jayendra Saraswathi, Bangalore-based journalist Imran Qureshi told BBC Hindi. Jayendra Saraswathi is head of the Kanchi Shankara Math, a leading Hindu monastic order. He was charged with conspiracy to murder along with with a junior seer Vijayendra Saraswathi. Prosecutors alleged that the two men hired hit men to kill Sankararaman, who was one of their former aides. Sankararaman reportedly wrote anonymous letters accusing Jayendra Saraswathi of misusing monastery funds. The allegations included embezzlement of gold procured for making a temple chariot and providing lavish lifestyles for the cleric's relatives. Both men denied the allegations and any role in the killing. They were granted bail in 2005. Jayendra Saraswathi is one of India's most revered religious figures and his arrest angered his Hindu nationalist supporters.